EA7 won also its second Euroleague game, prevailing in Zagreb after controlling the game basically for the entire 40 minutes with only some quick exceptions. The game was dominated in the fourth when the margin blew up to 16 points. Keith Langford, keeping his streak of 13 of the last 14 Euroleague games in double figure alive, led the team with 17 points. Omar Cook made five threes surpassing the 100 fors his career (he was 4 threes away at the start). EA7 shot 68% from two and 50% from three. Now the team is still perfect in Euroleague waiting for Caja Laboral next Thursday in Milan. FIRST HALF – Three by Fotsis, three by Cook, a long two by Langford. Olimpia starts well, goes up 10-4 and 12-6. Cedevita answers the call when Fotsis commits his second foul and has to take his place on the bench. A very long Gelabale jumper ties the game at 14. EA7 responds with a 5-0 run including a jumper by Stipcevic. With Bracey Wright an Gelabale scoring right and left, Cedevita goes up 27-22 early in the second. Now, Cook makes two three and Alessandro Gentile closes a fastbreak. EA7 is again up, 28-27. Two drives by Langford, Cedevita responds, Bourousis emerges: he gets an assist by Fotsis and scores. At halftime it’s 40-37 Olimpia, with Cook at 9, Bourousis and Langford at 8. 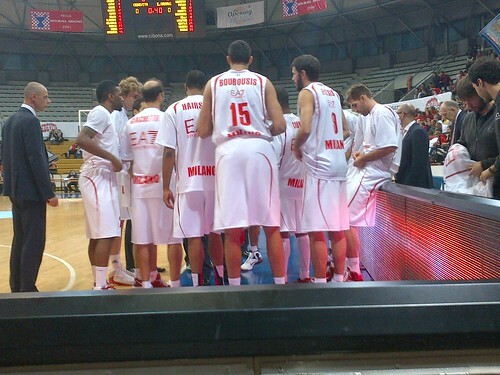 SECOND HALF- The first Malik Hairston goal return Olimpia up after a quick surpass by Cedevita. When Fotsis scores and Cook goes in double figure, it’s again 47-42 Olimpia. Cedevita ties with a 6-0 run at 49, but Bourousis make two from the line, Fotsis makes a three and EA7 is again five points up, 54-49. Rok Stipcevic scores first in the fourth: it’s a three. Basile make a corner three (now his streak of consecutive Euroleague games with at least a made three has reached 15) and in the last nine minutes, Olimpia is up by nine, 62-53. Now, the team is getting in control and close the game crusing. Keith Langford scores 7 consecutive points and the margin blossoms to 16. The closing minutes are very easy.